AUSTIN, Texas — Tiger Woods' long-awaited return to Texas and Match Play was a winner, even it if wasn't pretty. Woods opened the Dell Technologies Match Play with a 3-and-1 victory over Aaron Wise on Wednesday that Woods conceded wasn't much to look at. Of the seven holes Woods won, none were played under par. 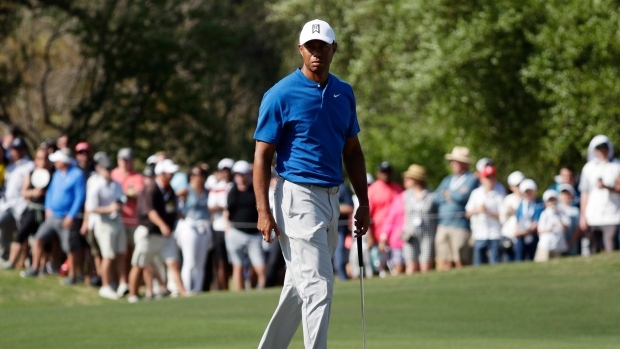 "If this was a stroke-play event, we'd be pretty far behind," Woods said. "But who cares? You move on. There's no scorecard except for whether you won the match or not." "I feel like I'm physically feeling better now," Woods said. "My neck has been freed up a little bit, and I'm able to get into a better posture and that helps." In the current round-robin format, Woods' victory gives him a big step toward the weekend's elimination rounds but doesn't quite guarantee it. He's still scheduled to play Brandt Snedeker on Thursday and Patrick Cantlay on Friday to finish out the group. "I'm just trying to beat the guy in front of me," Woods said. Wednesday's match was also Woods' first competitive round in Texas since 2005. He drew arguably the liveliest first-round crowd in the Match Play tournament's four years in Austin and it followed him for shots fans couldn't see over the undulating hills or through the trees. "That front nine? The people who walked it, good on 'em because you're not going to see much," Woods said. Wise won his title for Oregon in 2016. Woods won his at Stanford in 1996, weeks before Wise was even born. Last season's tour rookie of the year had never played with the 14-time major champion and he had almost no one in the gallery pulling for him despite winning the 2018 Byron Nelson three hours north in Dallas. Wise called the head-to-head round against Woods "fun." Woods is the No. 13 seed. Wise is No. 61. "I really respect what he's done in the game, and it was pretty cool to be able to watch him compete today and be alongside of him." After matching Woods' birdie at the par-5 12th, Wise played the final seven holes 5-over par, starting on the next hole when his ball spun off the front of the green into the water. "I got off to a pretty sour start," Wise said.